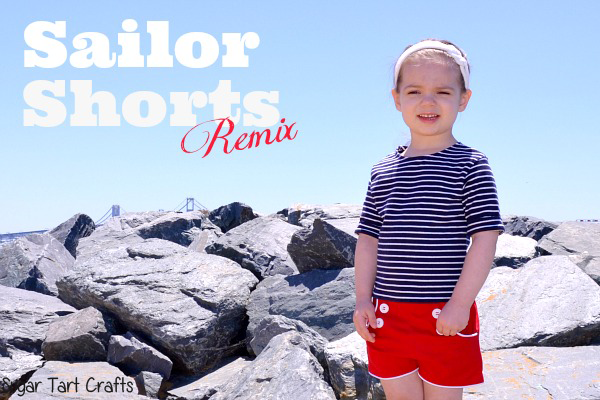 What would a Nautical Collection be without a pair of adorable sailor shorts? I broke down and ordered one instead. And honestly, I’m so glad that I did. 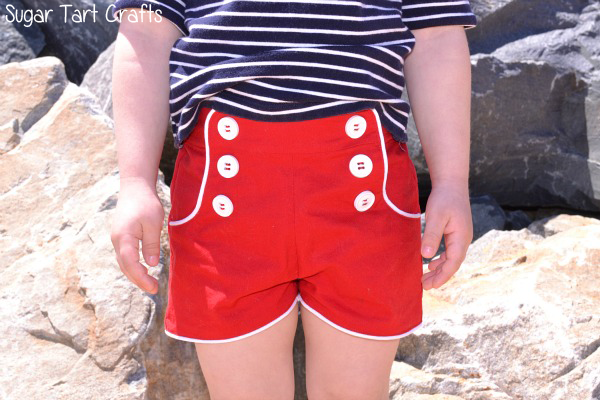 I started with the Sailor Shorts pattern from Peek a Boo Pattern Shop and it was lovely. Of course I can never leave well enough alone, so I did a simple pattern hack to replace the bias tape with piping. Then I left off the cuffs and added piping around the leg openings too. But how ridiculously cute are they? Amy has done any amazing job and they fit wonderfully! I’ll definitely be making these again and again for both kids, and I won’t even have to drive myself nuts with grading to do it! I mean seriously, I’m all for do-it-myself most of the time, but does everything have to be harder than necessary? Why not support some other blogging Momma’s once in awhile? They definitely make things much easier to understand than those commercial monstrosities! What do you think? Are you an “I can do everything by myself” kind of sewer, or more of a “whatever will make my life easier” kinda gal? (or gent!) What’s your definition of work smarter not harder? Saving money or saving time? Smarter, not harder*. Look how cute those shorts are, they're great!!! *Within reason, sometimes I just can't afford a pattern I have my eye on so have to make do with what I can afford and edit! Since you sell your own patterns I was wondering what you would say, but I should have known when I see you make other people's bags all the time! Absolutely Amy, I'm so glad you like them! You make an awesome pattern! I'm loving the piping! And those giant buttons! Swoon! Pinning this! A girl after my own heart! I would add piping to every pattern if I could! totally want some for me…great job! Oh man! Now you've got me wantin' a pair of my own…in floral! Thanks so much for visiting Carissa! Love your site! These are ADORABLE! Way to go, Mama! Thanks Krissy! I can't wait to make another pair for my son! Thanks T'onna! With a blog name like that, I can't believe your daughter doesn't already have a few pairs of her own. They'd be adorable on her! Brain-wash me to think that way! Please! I've got no idea why I think I've got so much extra time. Faster would definitely be better! Thanks Jolanda it's my favorite too. I know nautical is just so predictable, but I just can't help myself. It's all just so stinkin' cute! Ooh I love the contrast of white and red! Those shorts are so cute! These are adorable! I love the red and white contrast! Awesome Rebecca! Thanks so much! Adorable 🙂 Amy has wonderful patterns, and I love the addition of the piping! She definitely does, and I can't wait to make more! These are so cute! 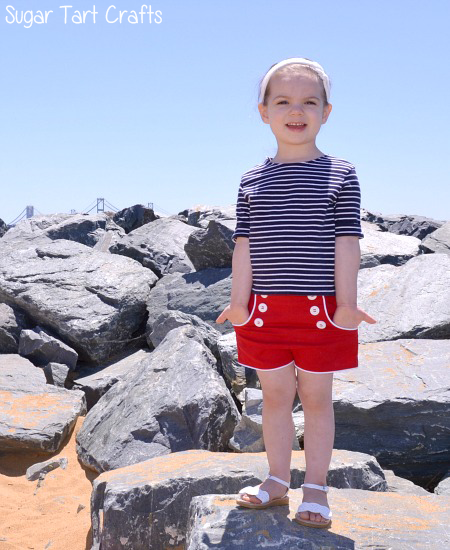 I love the nautical look on kids-I went a little crazy on it this summer for my toddler.